On Saturday my husband and I made our first trek down to visit his sister at college. Lindsey is a freshman at James Madison University, and we had a great time visiting with her. So much had changed since I’d last been there, 6 or 7 years ago. Her dorm was bright, sunny and even moderately spacious! We went to a cool little co-op type restaurant off campus for lunch called The Little Grill Collective; be sure to check it out if you’re in the area. We also explored a new library, some campus buildings, and the surrounding area. Of course I was dying to bake her something she could share with friends, but Lindsey isn’t wild about sweets (she’s lucky, I have no concept of this). After debating the possibilities with Edwin, he helped me decide on MUFFINS! 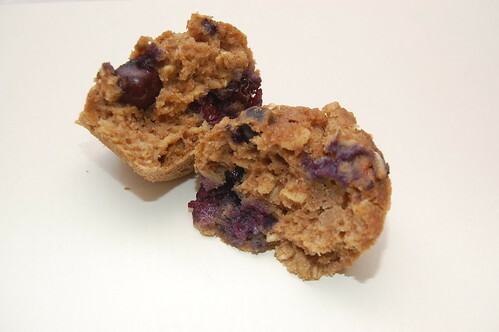 My original idea was to make one batter, divide it between three bowls, and fold in any extra ingredients like blueberries, apples or cranberries. That would be the smart thing anyway, right? I wound up making three separate batters because I couldn’t figure out a way to combine the different recipes I wanted to try and I wanted variety. 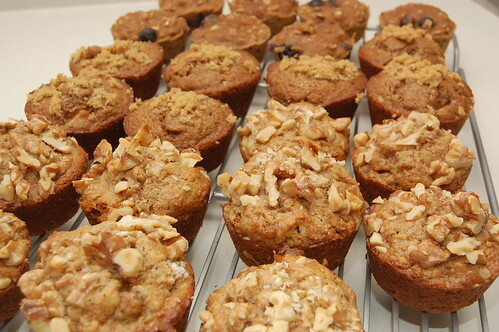 I made Oatmeal Blueberry Applesauce Muffins, Whole Wheat Apple Muffins and Banana Nut Muffins. I halved all the recipes (making about 7 each), and the Banana Nut recipe is the only one that I adapted from the original. If you follow our DINNERCAKES Twitter updates, then you may have heard I was having a difficult time locating a trustworthy Banana Nut muffin recipe. You’d think this is a standard and popular muffin, so I can’t figure out why! 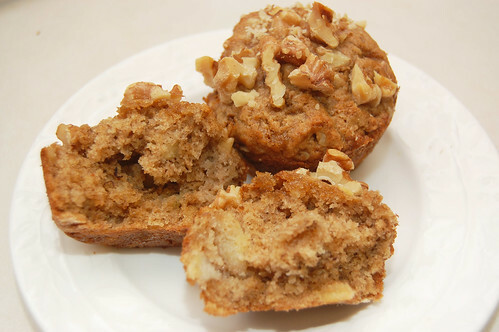 I used a recipe for plain Banana muffins from Martha Stewart, and I adapted it to add coarsely chopped walnuts to the batter and as a topping. I also added some cinnamon, nutmeg and sprinkled a bit of light brown sugar on top before adding the nuts. I’m really happy I brought Lindsey muffins instead of cookies or brownies. Something about baking muffins, smelling them in the oven (stealing one fresh out of the oven) and giving them as a gift is pretty great. 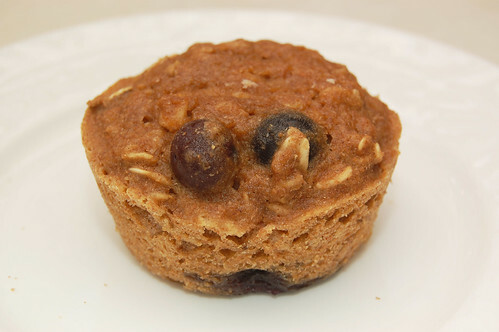 I may have liked the Whole Wheat Apple muffins the best, and next time I make the Oatmeal Blueberry Applesauce Muffins I think I’ll add more sugar. 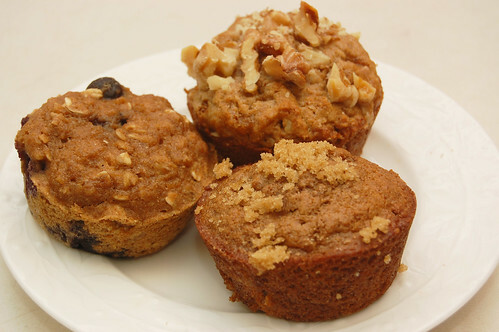 Really, I think I’ll be revisiting and experimenting with muffins again soon! Preheat oven to 375 F. Peel bananas and place in a stand mixer with a paddle attachment. If you do not have a stand mixer, use a potato masher or large fork to mash. In a large bowl, combine dry ingredients: brown sugar, flours, baking powder, baking soda, salt, cinnamon and nutmeg. Whisk lightly. In a medium bowl, combine wet ingredients: mashed bananas, oil, egg, sour cream and vanilla. Whisk lightly. Make a little space in the middle of your dry ingredients to pour in the wet ingredients. Stir very gently, combining only until moist. Gently fold in 3/4 of the nuts. Be careful not to over mix! Drop spoonfuls of batter into a well-greased muffin/cupcake pan (I greased the cups and top with butter, lightly floured and then lightly sprayed over that. I had no problems with sticking; I think a little greasing the pan overkill is a good thing!). Fill the cups about 3/4 full. If you like big muffin tops, then fill the cups up to the top but make sure you grease the area around the cups as well. Important: If you have a large muffin pan and won’t be using all the cups, fill the unused cups halfway with water so that everything bakes evenly and doesn’t burn. When done, sprinkle the tops with light brown sugar and the rest of your coarsely chopped walnuts. Bake for about 16-18 minutes. Cool for 5 minutes before removing from pan. 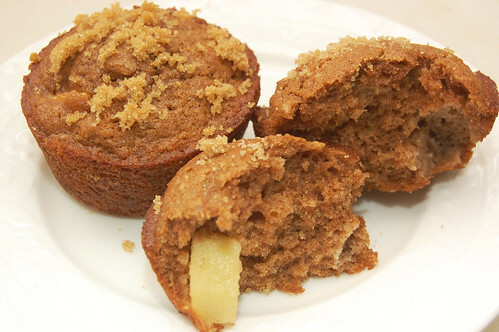 To safely remove them, insert a knife, toothpick, or cake tester carefully between the pan and the muffin to loosen the sides. Tilt the pan on its side and use the same tool to pop the muffins out individually into your hand. These look so good! Can’t wait to try them, thank you. I can honestly say that the banana nut muffins were delicious. : ) As were the others, but they are my favorite. My roommate and hall mates liked them as well. Thanks Heather! Teapot – Hooray! So glad to hear it. Between muffins and warm delivery cookies (I can’t believe you guys have a service like that… amazing! ), I hope you’ll get nice and fattened up soon 🙂 Thanks again!